Click on the map below to open it at a larger scale. If your cursor then shows a + sign, click again for a yet larger scale. Click on the map below to see a bigger version of it. If your cursor then shows a + sign, click again for a yet larger image. 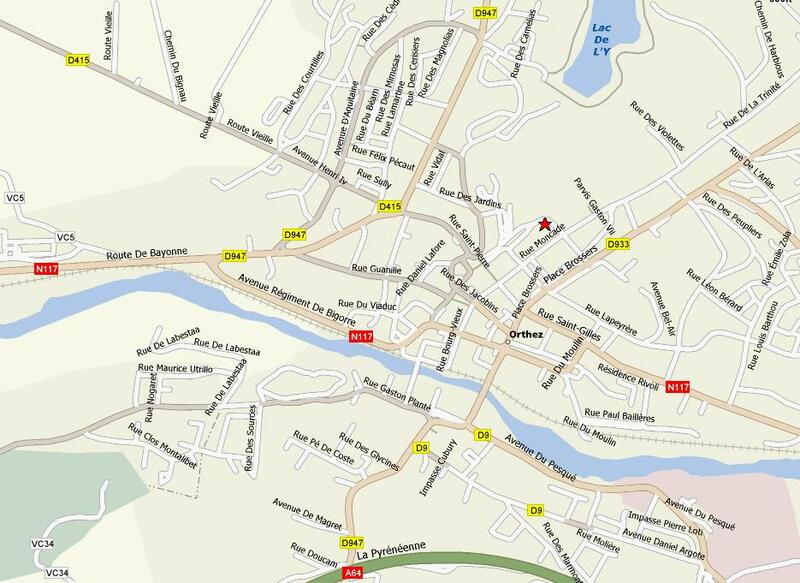 As you may see on the map above, the peaceful market town of Orthez has a railway line. This provides local services as well as TGV direct to Bordeaux and Paris. Access to the modern autoroute, La Pyrénéenne, is at Junction 8 near Biron (approx. 5 km from The Little House). The map above shows the main street layout of the centre of Orthez. The Little House is approximately at the centre of this map. 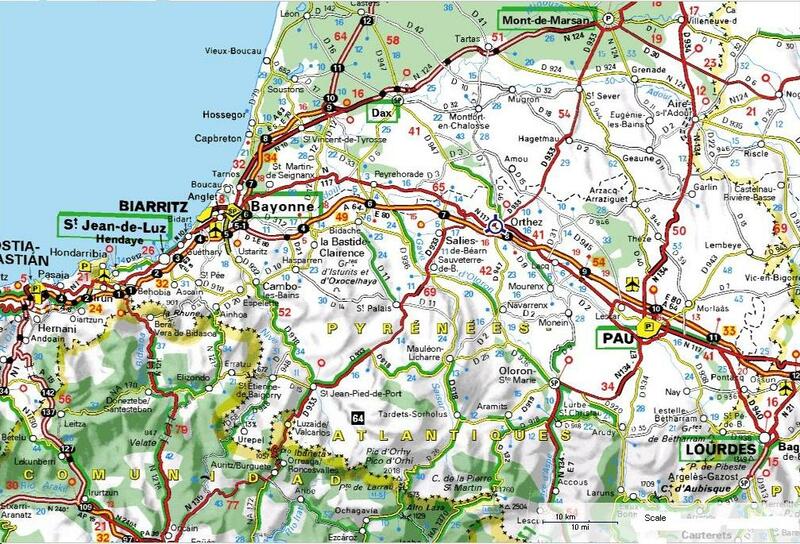 A more precise location is shown on the map below. 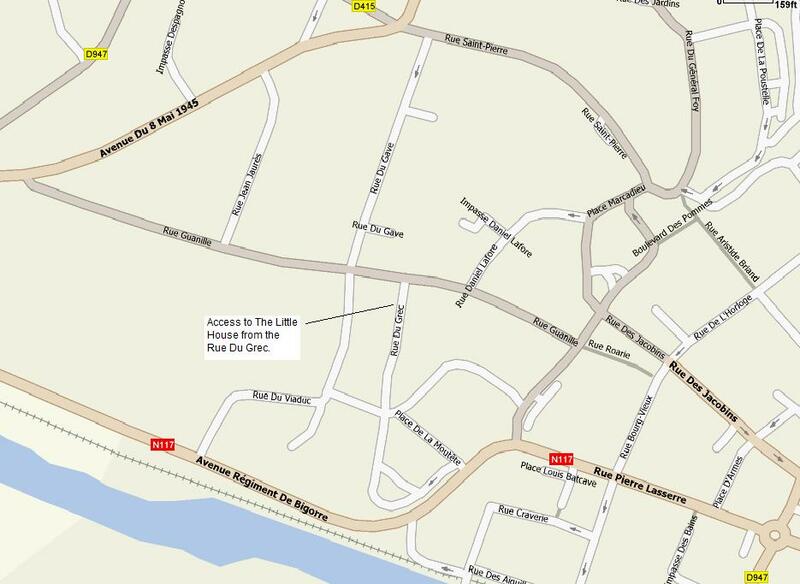 Parking and access to The Little House is from the Rue du Grec but keys should be collected from 3 Rue du Viaduc. The last battle of the Peninsular War before the abdication of Napoleon was the Battle of Orthez, fought on 27 February 1814. (There was a later battle, near Toulouse, which was fought because news of the abdication had not reached). The French, over the preceding months, had been gradually forced to retreat from Portugal and Northern Spain into the Pays Basque and Béarn. The terrain from Orthez to the north and north west, rising from the Gave (river) de Pau, provided good defensive positions for the French under Marshal Soult. They had also demolished all the bridges across the river between Bayonne and Pau, except the Pont Vieux at Orthez, and were defending all the main locations where Wellington's troops might try to cross. Wellington tried to pin Soult’s centre - while one prong of his attack was into and through Orthez, the other attacked through and around St.Boes. While things did not go well initially, Wellington, committed his reserves and, by noon St.Boes had fallen and Major General Foy had been driven back. The Pont Vieux (the old bridge) is said to be one of the most beautiful examples of mediaeval defensive architecture preserved to the present day, with its roofed tower (there were originally two) standing on the bridge itself. Although some repair of the parapets was required, it survived the defensive demolition attempt by the French forces and subsequently became the site of exchanges with Wellington's forces during the Battle of Orthez. (The Battle, 27 February 1814, was ultimately concluded on the rising ground just outside the town to the north and west. It was the final battle of the Peninsular War, although the Battle of Toulouse was fought after Napoleon had capitulated. The Napoleonic forces were put to flight, losing about 2600 of their troops killed or wounded, and another 1350 taken prisoner. The British / Portuguese allies lost perhaps 2300 killed and wounded). If you are interested click here to go to our own, more complete, description of the battle. This says that the number of English officers killed or died of their wounds was 23.